I am really liking this forecast model for the snow for Friday night. The snow will hold off until around midnight Friday night. The snow will fall overnight Friday night and Saturday morning. Then Saturday afternoon areas for SE Ohio will experience a wintry mix including rain. So locations, generally to the SE of I-71, will see some rain once we warm up near and above the freezing mark. The further SE you live the more rain and the lower your snow totals will be. If you stay cold enough for all snow then 2-4" of heavy snow is possible, but that will mainly be North and Western Ohio. Isolated locations may see slightly more than that, but it will be a heavy snow, so it will compress some as the snow continues to fall. Roads will be a little slick for Saturday morning and then very slushy for SE Ohio for later Saturday. The precip wraps up by Saturday evening, then maybe a few flurries Sunday with MUCH colder temperatures. 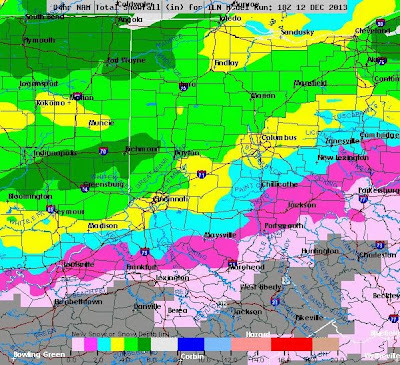 Looking at the longterm forecast... another round of measurable snow is possible for the end of next week again. Will keep you posted. Have a good one!